Buckeyeman Larry Lokai is pictured at the 2017 Darke County Ohio State Alumni Club Tailgate Blood Drive. 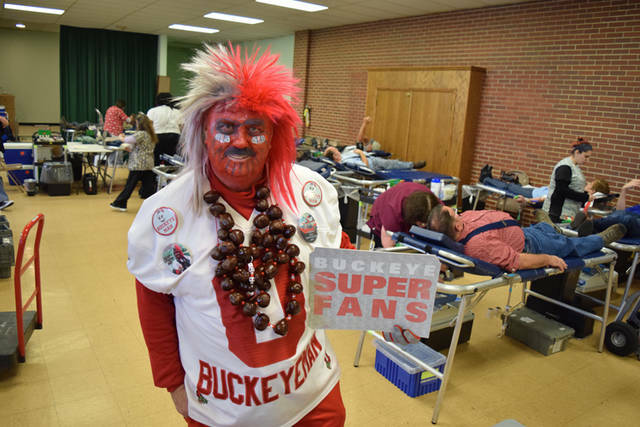 GREENVILLE – The Darke County Ohio State Alumni Club is teaming up with Community Blood Center and super-fan Buckeyeman to celebrate the 25thannual Tailgate Blood Drive from 12:30 to 6:30 p.m. Nov. 13 at the Greenville Church of the Brethren, 421 Central Ave., Greenville. Everyone who registers to donate will get the special edition “Get in the Game For Life” football T-shirt. Donors can schedule an appointment online at www.DonorTime.com or call 1-800-388-GIVE. The OSU Alumni Club again will transform the Donor Café into a Buckeye tailgate party with special refreshments, hot sandwiches, homemade cookies and traditional chocolate and peanut butter Buckeyes treats. Special guest Buckeyeman Larry Lokai is a celebrity cheerleader seen often at nationally-televised Buckeye games in his trademark red face paint, wild scarlet-and-gray wig and massive mane of Buckeye necklaces. Lokai is a faithful friend of the Darke County OSU Alumni Club who visits the Tailgate Blood Drive to crown donors with his handmade buckeye necklaces and pose for pictures that he quickly posts to his Facebook page. “Your 20 buckeye necklaces are ready for 20 special fans,” Lokai said. The “Get in the Game For Life – Lifesaving Blood Donor” campaign celebrates November as the time of year when football championships are made. The CBC fall T-shirt honors donors as champions for saving lives. CBC blood drives hosted by the Greenville Church of the Brethren include apheresis machines for platelet and plasma donations. Platelets are blood cells that help control bleeding. Plasma is the fluid component that helps maintain blood pressure. Both are vital to the treatment of cancer, organ transplant, burn and trauma patients. New platelet donors are in high demand, especially those with blood types A, AB or B-positive. Individuals can find out more at www.GivingBlood.org or talk to an apheresis specialist at 937-461-3220.